IN his continuing search for the more weird, wacky and wondrous in the world of travel, David Ellis says security officers puzzled at the shape of an item in a woman's suitcase being screened before she flew out of New York's LaGuardia airport earlier this month, were surprised to open the case and find a tiny 7-year old and very much alive Chihuahua staring back at them. 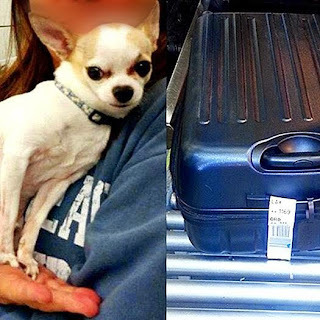 They tracked the case's owner to an aircraft boarding lounge, and after getting over her initial shock she said that the pint-size pooch, that was so small it stood on a security officer's open palm, must have slipped into her bag and buried itself amongst her clothes while she was packing for a trip to Los Angeles. Transportation Security Administration (TSA) officers allowed the lady to go on her flight, while her husband came to collect and take their pet home – where it doubtless found itself in the Dog House. FOOTNOTE: Plenty of other animals have been sprung after going aboard passenger planes without being declared, including in China a couple of years ago a tiny pet turtle that a male passenger said he couldn't bear to be separated from, and had tried to smuggle aboard a flight from Guangzhou to Beijing – hidden inside a KFC Chicken Burger.